Der Artikel Brownsville: Air (Collector's Edition) (Remastered & Reloaded) wurde in den Warenkorb gelegt. 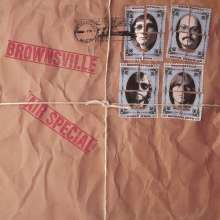 Special Deluxe Collector’s Edition / Fully Remastered Audio / One of the best North American mid 70s hard rock albums / 12 page full colour booklet – 4, 000 word essay, enhanced artwork, rarely seen photos and new interview - IT’S INEVITABLE THAT Brownsville Station will always be best remembered for their worldwide smash hit single ‘Smokin’ In The Boys’ Room’, a track recorded in 1973, and re-ignited twelve years later in 1985 by Mötley Crüe. It is without question their signature song and an all-time rock classic but it is also one of those creations that, like Golden Earring’s ‘Radar Love’, ham strung the artist to the point where they could never quite recover from or eclipse their main achievement. By the late 70s Brownsville (having dispensed with the Station part) had reached a new level of confidence. Signing with label giant Epic records, and managed by long-time confidant Al Nalli, the band appeared to have finally put their past behind them and were well placed to make a major offensive. 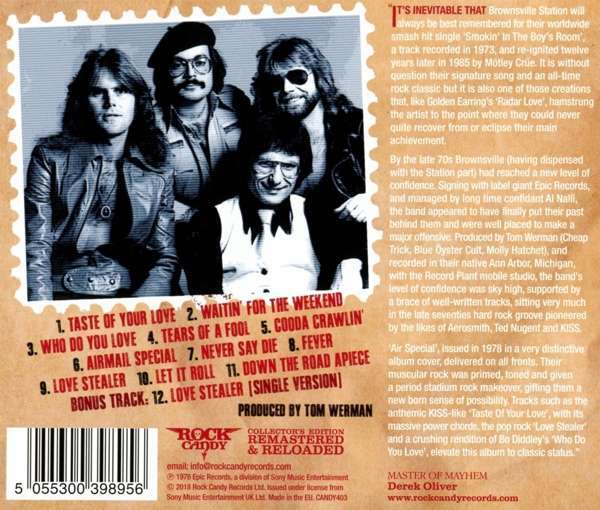 Produced by Tom Werman (Cheap Trick, Blue Oyster Cult, Molly Hatchet), and recorded in their native Ann Arbor, Michigan, with the Record Plant mobile studio, the band’s level of confidence was sky high, supported by a brace of well-written tracks, sitting very much in the late seventies hard rock groove pioneered by the likes of Aerosmith, Ted Nugent and Kiss. ‘Air Special’, issued in 1978 in a very distinctive album cover, delivered on all fronts. Their muscular rock was primed, toned and given a period stadium rock makeover, gifting them a new born sense of possibility. Tracks such as the anthemic Kiss-like ‘Taste Of Your Love’, with its massive power chords, the pop rock ‘Love Stealer’ and a crushing rendition of Bo Diddley’s ‘Who Do You Love’ elevate this album to classic status.